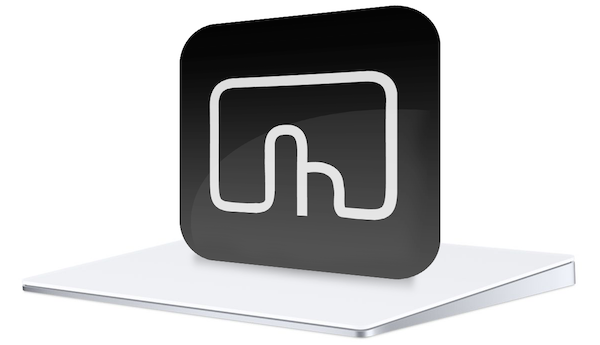 Previously on the Mac Security Blog, we outlined how to set up your Mac’s trackpad. 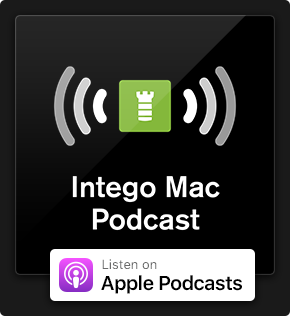 Whether you’re using a Mac notebook or a desktop machine with a Magic Trackpad, multitouch input — when mastered — can greatly improve your productivity. However, the options Apple provides in the System Preferences Trackpad pane only go so far — and it turns out your trackpad is far more capable than you may have ever realized. Fortunately, this power can be unlocked by third-party software like BetterTouchTool. 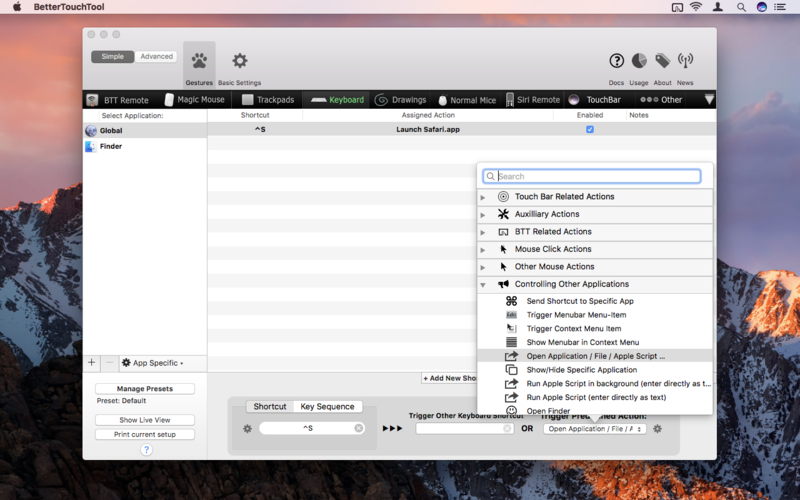 On installing and launching BetterTouchTool, the app will appear in the menu bar. From there, you can access its preferences. This large window offers a number of sections, which typically involve you defining inputs and assigning actions to them. For this article, we’re primarily interested in the Trackpad settings, so click Trackpads. Next, click Add New Gesture and you’ll see the Touchpad Gesture menu appear at the bottom of the window. From there, you select the gesture you’d like to use to trigger your action. Within the Touchpad Gesture menu, open the Single Finger Gestures section; you’ll quickly see how much more nuanced BetterTouchTool’s settings are than Apple’s. With a single finger, Apple enables you to activate tap to click. By contrast, BetterTouchTool offers gestures that track where you tap or click. Let’s try a quick example. Select 1 Finger Tap Top Left as your gesture. Next, click the Predefined Action menu, scroll down, and open Utility Actions. From within, select Open URL/Open URL With Selection. In the sheet, type a favorite website address and then click Save. 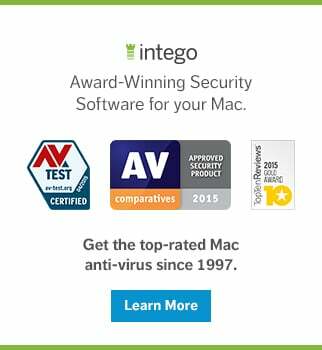 Tap at the far top-left of your trackpad and Safari should open your defined website. If you’re concerned about accidentally triggering this in general use, you can always add a modifier key by checking one of the checkboxes under Touchpad Gesture. For example, check Shift and the action will only be triggered when you hold Shift and tap the top-left corner of the trackpad. In reality, it’s unlikely basic tap gestures will interfere with day-to-day trackpad use or existing settings, but more advanced ones can. In relevant cases, BetterTouchTool provides warnings about potential clashes, such as for three-finger tap and swipe options. One way to ensure there are no clashes is to go ‘maximum digits’ and create five-finger gestures, which Apple doesn’t offer a means to do anywhere in System Preferences. In Five And More Finger Gestures, select Five Finger Swipe Down. From Predefined Action, use the search menu to find Minimize Window Below Cursor, and then select it. Now, when you five-finger swipe over any window, it’ll minimize to the Dock. Let’s keep going. 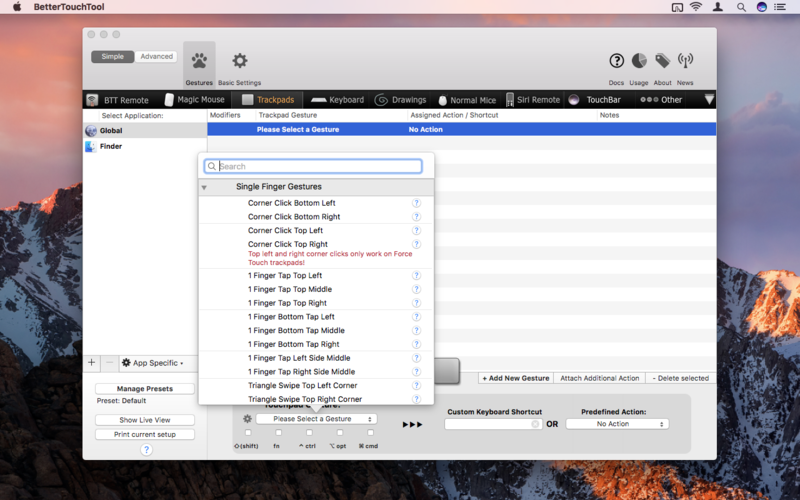 Create new five-finger swipe gestures for upwards, leftwards, and rightwards swipes. 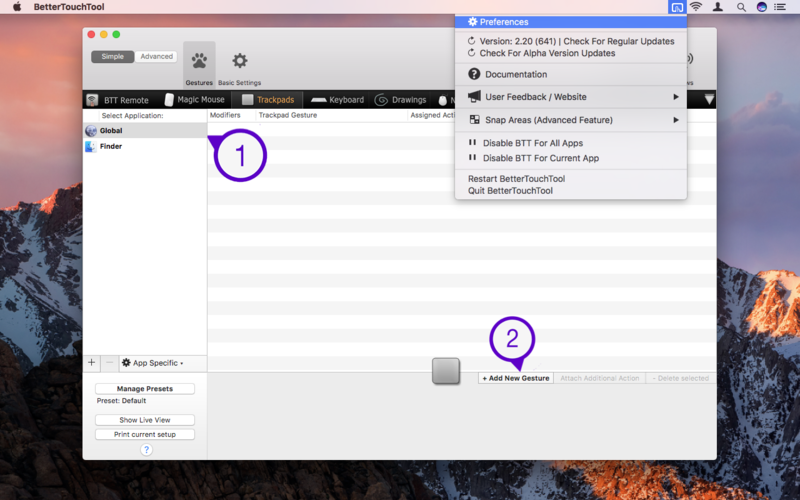 Respectively, assign Maximize Window, Maximize Window Left, and Maximize Window Right actions. 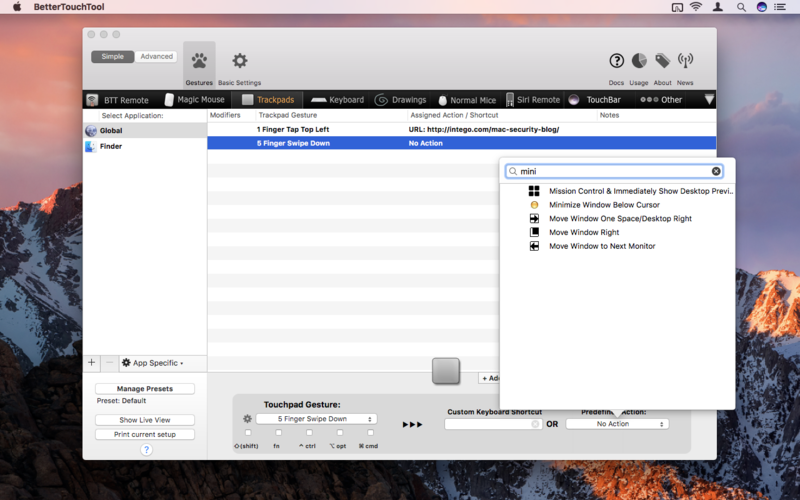 In Finder, open a new window and use your new gestures to rapidly make the window fill the screen, and then just its left and right half. This is just the tip of the iceberg when it comes to BetterTouchTool. There are many more gestures and actions to discover, the latter encompassing everything from taking screenshots to triggering system actions. Keyboard shortcuts can be triggered instead of actions, too. You can also assign gestures to specific apps: add an app to the sidebar, and select it rather than Global before creating a gesture. Elsewhere, explore the other categories. Consider setting up keyboard shortcuts to launch often-used apps, or to open up folders you regularly work with. And if you find BetterTouchTool becomes indispensable, select Basic Settings and make sure you check Launch BetterTouchTool on startup. BetterTouchTool offers a free trial; if you wish to continue using the app indefinitely, you’ll need a license, which is on a ‘pay what you want’ model (ranging from $4.99 to $50.00). 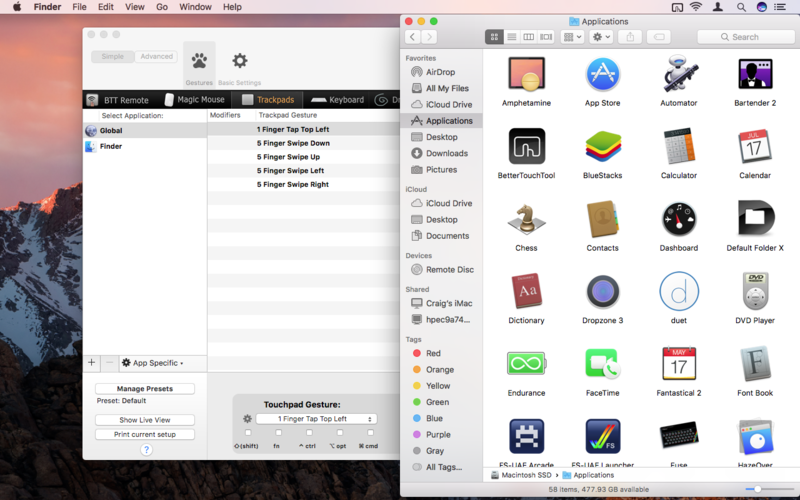 This entry was posted in How To, Software & Apps and tagged BetterTouchTool, Mac, Trackpad. Bookmark the permalink.